The description of competences and the associated bodies of knowledge, skills and attitude (download pdf version) have been developed between October 2013 andFebruary 2015. Representatives of the involved organisations formed several multi perspective, trans sectorial focus groups to brainstorm, structure, write, review, and improve the competences and bodies. This was mainly done at the partnership meetings in Münster/Germany, Brussels/Belgium, Konya/Turkey, and Stockholm/Sweden. To achieve a high level of practical relevance the partners also visited youth work organisations during the meetings and discussed the draft versions with local partners in between the meetings to get feedback. 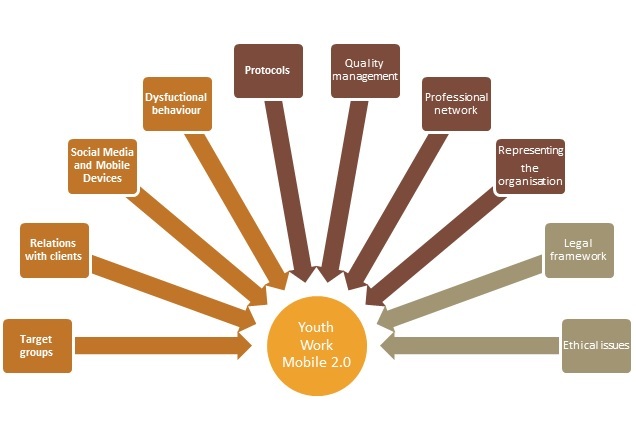 The YOWOMO2.0 competence model for youth work in the age of smartphones and social media comprises ten competences within three segments. The three segments represent the work with clients, the work within an organisation and the legal and ethical background. In the first segment – work with clients – the competences are related to the online interaction with different target groups, to the relation and network building with young people, to the use of social media, mobile devices and apps in the work with young people, and to the handling of dysfunctional use of social media. The second segment – work within an organisation – includes the competences to handle protocols for using social media and mobile devices, to improve the quality of youth work applying social media and mobile devices, to network with professionals of other disciplines, and to represent the organisation following the policy of the organisation using the possibilities of social media and mobile devices. The third segment – legal and ethical background – covers the competences related to the legal issues and ethical problems associated with the use of social media and mobile devices in youth work.